This comment originally appeared on the Hudson County View under mayoral candidate Karen Nason's letter slamming her opponent Ravi Bhalla for the mailer as seen below. 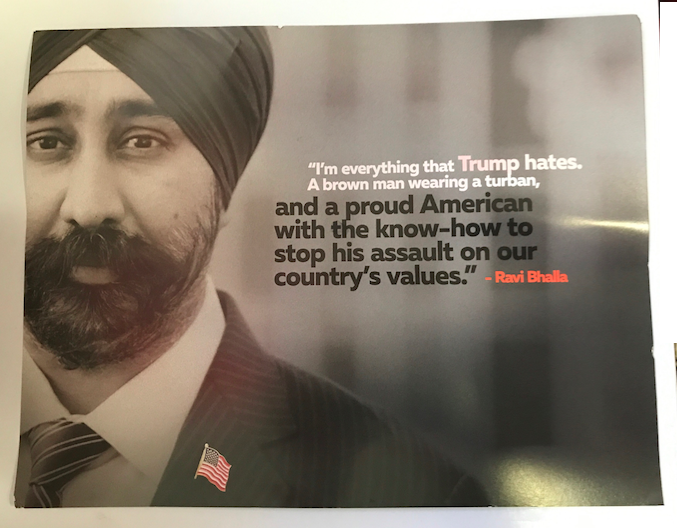 It's noteworthy as it speaks to the cynical and divisive political mailer by Councilman Ravi Bhalla. The divisive cynical mailer is backfiring with people of color. I was really disappointed when we received this mailer last week it’s so divisive. This post will be a good dinner table discussion with our kids tonight. You see, I’m a Native of Brazil who is also black, my wife a 1st generation Filipino- American who was raised in downtown Jersey City right on Manila Avenue and 7th Street. Our beautiful children have had to deal with racism many times- but not in Hoboken, here our kids walk over to the BowTie Cinema at night, go to Benny Tudino’s pizza on a Saturday night without any incident. The town is amazing, they have friends from all backgrounds with parents from various types of unions. Our Son just served as usher and our daughter played the piano at the wedding of our neighbors same gender wedding right here on the waterfront. It was 2010 and 2 years into Obama’s term when we rented our 1st apt in a Carriage House on Hudson St. We faced zero discrimination. Zero awkward questions. Zero denials and Zero odd stares – our landlord would baby sit for our daughter and called them her family- she still comes over with basil from the yard. To my point, we were 1000% Bernie supporters and devastated at the convention results, but still we voted for Hillary, nobody is more ill or threatened by Trump’s hate than a family like ours ( and I’m sure like Ravi and many others we are a worried). We always vote so over the past month, we made it our business to learn about all of the 4 major candidates and including Bhalla- and after this article above and the fundraiser Karen Nason having for PR we are going to make it our business to meet her in person. We also want to go see Giatinno, Romano and DeFusco again. I will NOT be going back to speak to Mr. Bhalla ( despite the fact that my wife sort of liked Emily Jabbour when they met at the 9th street light rail ) the reason is that after I saw this hyper targeted mailer -which we believe he mailed to us based on our obvious ethnic last names we feel used, exploited and honestly got the impression they think we don’t see through this thinly veiled baiting. Especially since our friends with “ non- ethnic” surnames did not get this letter. I’ve been a citizen for 15 years and never voted for a Republican, so despite Giattino and Nason both being members of that party and Hoboken is after all a nonpartisan district- we’ll go and learn about the R’s in this election’s social positions- then we will make a decision. Thank you for listening to a first-person account.